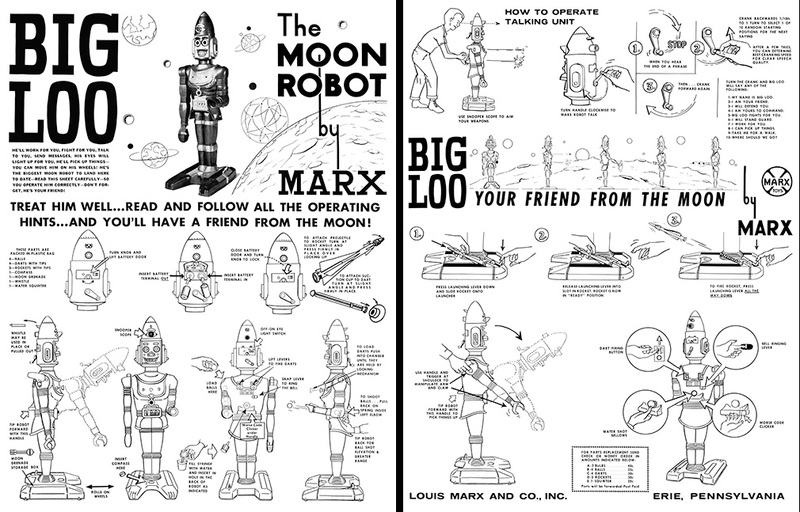 This is a masterfully executed presentation of Page One and Page Two of the Original Instruction sheet that came with the Big Loo Robot, circa 1963. Both pages have been carefully restored by a professional artist. The line work is as original and the graphics are impeccable and retains the original artists’ occasional overruns and minor mistakes. We resisted the temptation to fix any of these imperfections and now you can view them in superb resolution. This is not a cheap scan and is a huge advance in over all quality. To achieve this result, we sought out a pristine example of the Original Instructions and then quadruple imaged them on a Hi-Def scanner. Then our professional artist went to work restoring all the lettering drop outs and faded line work as even the best originals were economically printed which did not lend themselves to being reproduced in high resolution. The instruction sheets are printed, NOT PHOTOCOPIED on 20 pound paper stock which simulates the feel of the originals supplied with Big Loo in 1963. We prefer the heavier paper stock (60 pounds) which we use in our colorized version but if you looking for the feel of the originals, this is it. Our high Resolution recreation presents this historical out-of-print artifact in the sophisticated manner it deserves. As you may know, the Marx Toy Co. went out of business in 1979. Although the 1963 version was economically printed on front and back to save money, our version is supplied on two sheets, one side only. This allows the option to frame each one or just display them separately. We also disliked the bleed through from the opposite page that always occurs and the 1963 original set were especially bad in that regard. Two sheets solves that problem nicely. They are shipped in a cardboard tube, carefully rolled and never folded. Order from the Shop on the Home page.